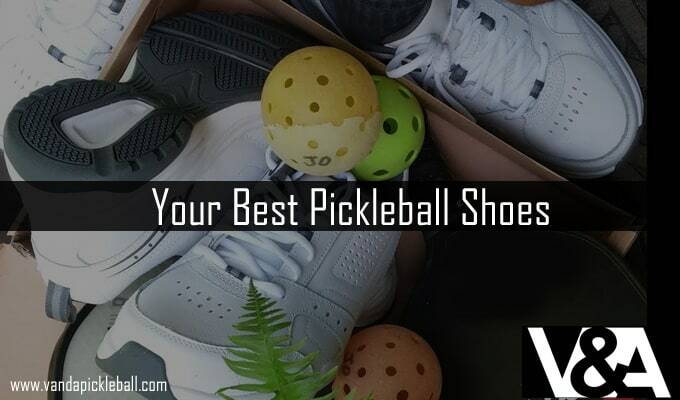 How to choose the Best Pickleball Shoes? Reviews of Pickleball Shoes. Can You Use Any Shoe? Surprisingly enough, there aren’t any official Pickleball shoes or sneakers yet. This means that for now, players must make do with what is available. Since there are so many athletic shoes out there, it is difficult to know which shoes you should choose. Will your normal sneakers work? What should you be looking for? What type of shoes should you get? Which features are the most important? These are all very important questions that we will be answering. 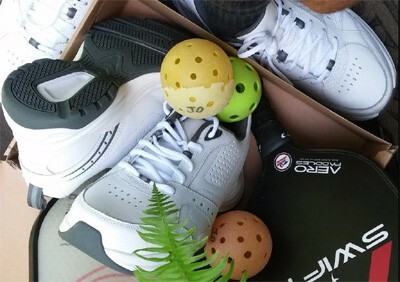 We will also review 10 of the best shoes for Pickleball players. So, relax and let’s help you find your ideal Pickleball shoes. No, you cannot use your running shoes for playing Pickleball. Running shoes are designed specifically for the forward motion only. You need court shoes, which are designed for the forward-back and side-to-side motions. Court shoes also provide the necessary grip on the court so that your feet have proper support during those fast-paced games near the net. Court shoes also provide cushioning for your knees and back during the game, which is more important than you realize. Many people don’t like court shoes because they feel “heavy”, and this can be an issue with some court shoes. That is why we’ll be showing you what to look for. Why don’t we break the shoe down by component to show you what you should look for? You should be looking out for the upper that’s made from leather, synthetic leather or combination of these tow with a fabric or mesh. Lately, fewer court shoes are being made with leather, since synthetic leather can offer as much stability, if not more, without breaking down. Leather eventually softens over time which means that there will be a loss in stability. Synthetic leather is also much cheaper. You need to keep an eye out for stability. This part of the shoe should provide the utmost stability, or else you could seriously injure yourself. Most court shoes provide a structural element on the sides of the upper that provides added support once it is on. When you are trying on court shoes, see how locked-in the shoe feels when you move from side-to-side. This is based on your foot and personal preference. When looking at the midsole, you need to look at the height of the arch, the width of the mid portion of the shoe etc. Best way to find out which one is suite you well is to trying them on. Arch is usually a good thing since it will support the shape of your foot, but that is up to you. When looking at outsoles, it would be a good idea to make sure if their non-marking shoes. This means that your shoes won’t leave skid marks on the courts. Thankfully, Pickleball courts don’t take such a big toll on your outsoles and so durability shouldn’t be a big problem. You do need to look at the durability of the insole. However, if your back and knees start aching, then it is time to find new shoes. Tennis Shoes,Volleyball Shoes or Indoor Court Shoes? As you might have guessed from the name, indoor court shoes are made for playing indoors, while tennis shoes are made for playing outdoors. Since Pickleball is played both in and outdoors, it is up to you to determine which kind you need. Tennis shoes tend to be more durable, but indoor court shoes tend to be lighter. Neither should affect your game too much, so it is your choice as to which pickleball shoes you want to use. However some cases, people tend to play indoor in rec space area that has wooden floor. People recommend a pair of volley ball shoes as they tend to have better grip on wooden floors. But our experience so far has been that the volley ball shoes tend to have a “sticky” sole for better movement on wooden floor and they tend to disintegrate faster on an tennis court. If price and lack of versatility doesn’t matter to you, then we would recommend getting a pair of volleyball shoes. Keep in mind that you shouldn’t buy a shoe until you have tried it on for yourself. So, try to find these brands in normal retailers where you can try them on before ordering them online. This shoe is made from synthetic materials and features a rubber sole. The shaft measures approximately 2.5’’ from the arch. It is a tennis shoe with mesh upper featuring Solyte midsole, rearfoot and forefoot, as well as gel cushioning systems for enhanced comfort. It has a memory foam-lined collar and heel. These shoes were designed for outdoor courts, and they do well. The shoes come in a range of attractive colors for you to choose from. The grip is great, but the shoes sizes might be a little off. So, try them on before buying them. The upper is made from textile components that have been imported from various parts of the world. The shoe has a rubber sole to provide a firm grip on most courts. The shaft measures approximately low-top from the arch, and the shoe features a removable insole. The shoes are lightweight, so you can walk onto the court and be ready to put your best foot forward. Aggressive players will appreciate the supportive TORSION system that supports your foot with every lunge. The shoes also feature ADIPRENE under the heel for enhanced cushioning. These pickleball shoes have incredible grip for dink game and helps to prevent you from rolling your ankle. It could do with a little more toe protection, but otherwise seems like a good shoe. Textile/synthetic construction, with a rubber sole. The shaft measures approximately Low-Top’’ from the arch. It is incredibly lightweight so that you can move more easily on the court. BOUNCE technology provides the energized comfort you’ll need on court all day. The upper shoe has been properly ventilated with synthetic overlays. Features ADITUFF technology for the best abrasion resistance in the toe area. The AIWEAR 6 outsole offers the best high-wear durability. These are great shoes, but the design might be a little different from what you’d expect. It does also have a lot of incredible features that make them a worthy consideration. Synthetic and mesh construction with a rubber sole. The PRC 100 outsole provides amazing durability, and the wishbone shank design provides increased mid-foot stability. This shoe is an improvement from the T10 design and is an aggressive evolution from its predecessor. It offers improved ventilation while still providing excellent durability and support. This shoe seems to be very popular among users and manages to get great reviews. They are comfortable and durable, but they do tend to be on the heavy side. This shoe features a rigid 180 PCS mid-foot support, with a plush tongue and color for your comfort. It has breathable fabric lining for an amazing in-shoe experience. The molded EVA insole offers underfoot cushioning and a non-slip heel lining. The midsole also provides extra shock absorption, as well as added comfort. The durable rubber outsoles also deliver the maximum durability and traction. This shoe focuses on comfort and hits a bit of a miss due to the inside fabric being a bit scratchy and uncomfortable. Other than that, it has great support and breathability. The synthetic/mesh construction means that this shoe is incredibly light and durable. It has a rubber sole for great traction, as well as a durable Aosta 7.0 rubber outsole. The rigid 180 PCS mid-foot support chassis provides incredible support and shock absorption. It also features a dual intensity Guideglide EVA midsole for extra support and shock absorption. Your toes will be protected with a Durawrap toe guard, and a K-EVA strobel board for enhanced cushioning. These shoes provide incredible traction while remaining comfortable. You might have to replace the inserts with something that offers more support, but other than that it makes for a fantastic fit. The knit upper expands naturally with your foot to prevent irritation and provide a great fit for you. The SPRINTFRAME technology and construction uses new geometrical research and a new stud configuration to find the right balance between sturdy and lightweight. The seamless bootee construction provides the ultimate fit and comfort, while the TORSION system keeps the midfoot integrity. The shaft on this shoe measures approximately 2.75’’ from the arch. The rearfoot and forefoot gel cushioning systems acts as shock absorption during impact and toe-off phases, it also allows movement in multiple planes as the foot moves through the gait cycle. The shoe also features PGuard toe protection with enhanced to durability. The Flexion fit upper provides form fitting comfort without losing any support. The Solyte midsole compound is more lightweight than former designs and features enhanced cushioning and durability. The shoe offers great protection from moisture when you step in puddles, but aren’t very comfortable to stand in for long periods of time. The fit can be a bit small, but other than that the design is remarkable. This shoe is made from leather for a more durable construction, it has a rubber sole and the shaft measures approximately 2’’ from the arch. The heel measures about 1.75”. The lace-up training shoe features supportive internal shank and shock-absorbing technology. It also features an IMEVA midsole. This is an excellent pair of shoes that are very comfortable. Unfortunately, the design seems to have caused the shoes to be a bit smaller than usual. 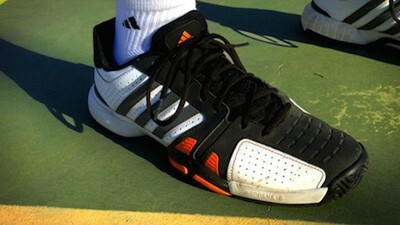 Although there are no official best pickleball shoes yet, there are many other shoes that will work just as well. Remember that quality beats attractive design, and you’ll be just fine. I shared this with a lovely client of mine who very much enjoys pickleball.